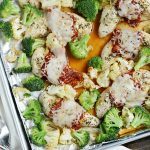 This delicious Sheet Pan Honey Mustard Chicken Dinner with broccoli and potatoes takes about 30 minutes to make, and clean-up is incredibly easy! Have you heard about sheet pan dinners? This is seriously my new favorite way to cook dinner because it’s quick, easy and there’s almost no clean-up. I’ve been seeing so many sheet pan meal ideas around lately, so I really wanted to try this method. I’m a huge fan of one-pot meals, and this method is even easier. I originally made this one-pan chicken dinner with veggies for the first time a few weeks ago, and friends, my family honestly devoured it in a few minutes! The kids just kept dipping their meat and veggies into the sauce until their plates were completely clean. Even my pickiest eater liked it. And if she likes something, you know it’s good. Since then, we’ve had this honey mustard chicken several times, and either I would forget to take pictures, or I wasn’t happy with the results. I hate it when that happens! So, this time, the stars, moons, planets and just about everything else aligned perfectly, and I’m finally posting this recipe. 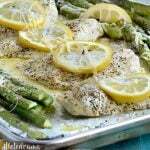 Basically, all you do is cut up some chicken breasts so that they’re not too thick, and then you place them on a foil-lined baking sheet. Next, you add spices and brush a mix of honey and mustard over the meat. The idea behind a sheet pan dinner is that everything cooks together on one baking sheet. So, I added some small baby white potatoes. I planned to use broccoli, but since it doesn’t take long to cook, I added the broccoli florets right before the dinner was done. I like to add a little extra olive oil or butter right before serving. And, I usually add a little bit of shredded Parmesan cheese for extra flavor. These steps are totally optional but so worth it! Using foil to line the baking sheet is optional, as well, but this makes clean-up even easier. Just roll up the foil when you’re done and toss it into the trash. Can’t beat that! 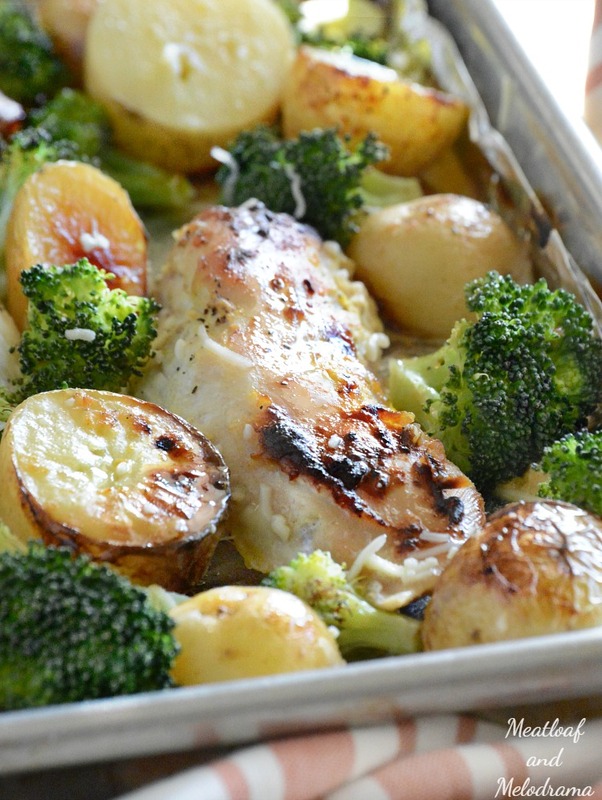 A light and healthy one pan chicken and veggie dinner that takes just 30 minutes to make! 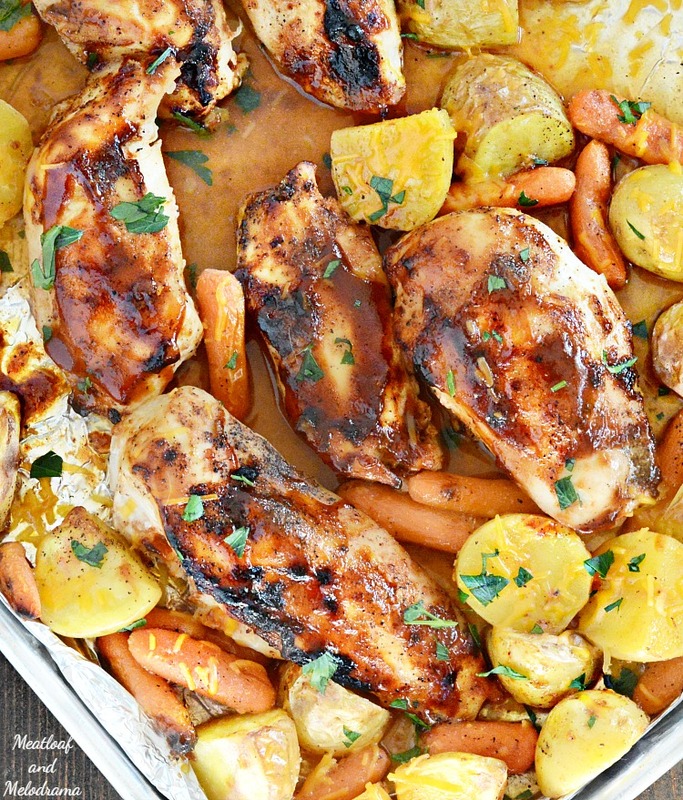 This sheet pan honey mustard chicken dinner recipe makes a lot of food. You can easily reduce the amounts to suit your needs, or you can use the extra leftover chicken for other meals, like this cranberry apple walnut chicken salad. Easy peasy — my favorite kind of dinner! I’ve been experimenting with other one pan dinners, like this Sheet Pan Honey BBQ Chicken Dinner. I can’t wait to share more! I may be slightly addicted to these easy dinners, can you tell? How simple is that! Passing this recipe on to my sister and her family. Sheet pan dinners are the best! You just can’t beat easy cleanup! I can’t wait to try this honey mustard version! Yes! I hate doing dishes, so I’m in love with this method! I am sold on sheet pan suppers. The best idea ever! I totally agree. That person is a genius! I just love one pot (or one sheet pan)meals! 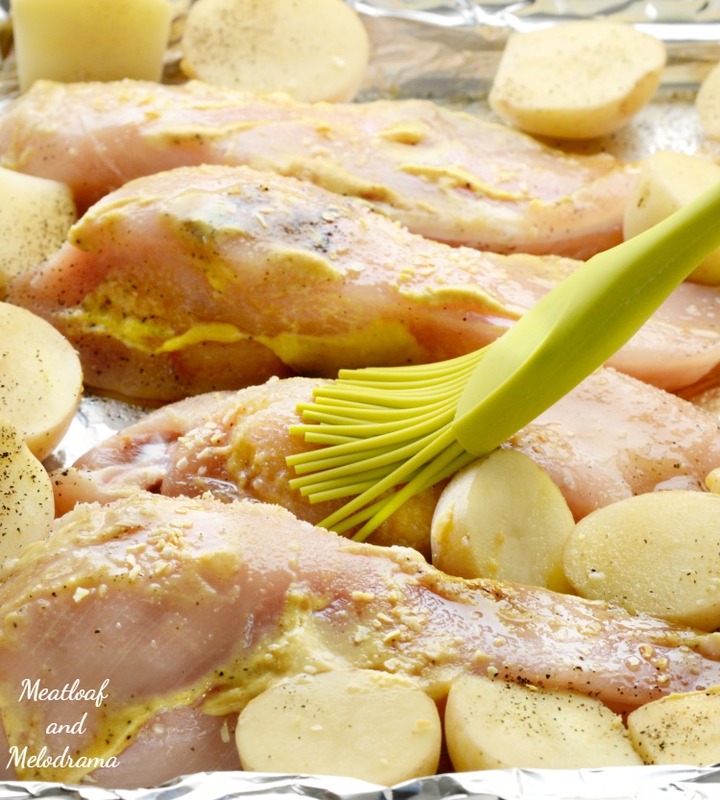 So easy and less clean up…love this chicken idea!! I am obsessed with sheet pan dinners! 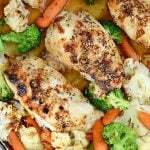 My Hubby will love this honey mustard chicken! Now THIS is what I’m talking about! My dream dinner! Thanks, Becky. It’s one of my favorites, too! Honey mustard is one of my favorite flavors! This is such a great dinner! Thanks so much Cathy. We’re slightly addicted to this! This recipe was worth the wait! Really excited to try a one pan meal! Oh my goodness! This sounds fabulous. I LOVE honey mustard. Can’t wait to try this simple cooking method. Thanks so much for sharing with us at Weekend Potluck. Please come again soon. Honey mustard sounds really tasty and I always love easy cleanup! YUM OH YUM! This terrific dish grabbed our attention at Weekend Potluck and is being featured this week. I have already made it…so good. I’m in love with honey mustard. Hope yours is a lovely weekend. Your recipe is featured on Full Plate Thursday. Enjoy your new Red Plate and thanks so much for sharing with us!